Every Sunday we prioritise being together as a church from across Portsmouth and beyond, to worship, receive teaching and celebrate the grace of God together. All are welcome to join us! We meet at the John Pounds Centre, just off Queen Street in Portsmouth city centre (PO1 3HN). The band kicks off at 10:30am when we worship together singing a mixture of contemporary songs & hymns. After this, we spend some time listening to teaching from the Bible which we hope will be relevant and accessible to all. Following the sermon we will take communion together, we do this to remember and celebrate what Jesus has done for us in His death and resurrection, through the breaking of bread and the drinking of wine. Our main service ends at 12pm, when we head through for coffee, and a chance to catch up with our church family. Our Ministry Team stay in the main hall, if you would like someone to pray with you, but you are just as welcome to ask for prayer over a cup of coffee in the café. If it is your first Sunday with us, check out our Connect Area in the café, where our team will make sure you are looked after, and help answer any questions you have. Our Sunday Morning services are tailored for the whole family. We are a growing church and are blessed to have many babies born over the last few years. We prioritise supporting parents with their children, wanting church to be a relaxed and friendly environment for all. We have an area with soft toys for parents and babies (0-1 year) in our main hall which can be used during the service. There is also a dedicated nursing area (mums only) in the library area (look out for the signs) for mums who would like to feed their babies in a more comfortable, relaxed setting while listening to a live audio feed of the service. All our children’s groups aim to provide children with a fun atmosphere and a focus on praise and learning more about our great big God! After the meeting is a great time to meet other people! There are always people on hand to welcome you and answer any questions you may have. You may wish to complete a ‘stay in touch card’ so that we can check-in with you during the week and get to know you better, or you may want to make a speedy getaway, either way we hope you’ll enjoy your time with us. The John Pounds Centre is well served by many public car parks in and around the area. If you come to our St James’ Street entrance you can pick up a free parking permit for the local streets or some change for the meter. 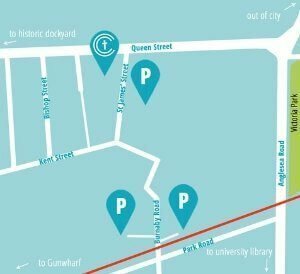 Check out our Parking Page (click here) for a quick run-down of the best parking spots.